Planning your wedding is such a special time that’s filled with excitement and lots of decisions! You’ve found the perfect dress, venue, groom…and now it’s time to find the perfect hair. There are so many styles to choose from, but keep in mind the weather around your chosen date, your dress neckline, and most importantly, what you are comfortable with! Check out these stunning bride hairstyles and get inspired for your special day. Sleek and simple, a side bun is a classic style that is easy to achieve and looks beautiful on everyone. Apply a smoothing cream to damp hair and comb through to ensure it covers all of your hair. Blow dry hair straight using a round or flat brush. Create a part in the front of your hair. It can be straight, angled, or slightly imperfect — it all depends on your style. Smooth hair back to chosen side. Secure with an elastic that is clear or matches your hair color. Add flowers, a veil, or any other beautiful adornments you have for your special day! My favorite smoothing cream is Pravana’s Model Behavoir. It smells amazing and gives your hair a soft, shiny finish. Any face shape can wear this classic look It’s all about finding the right part and how sleek you feel comfortable with. 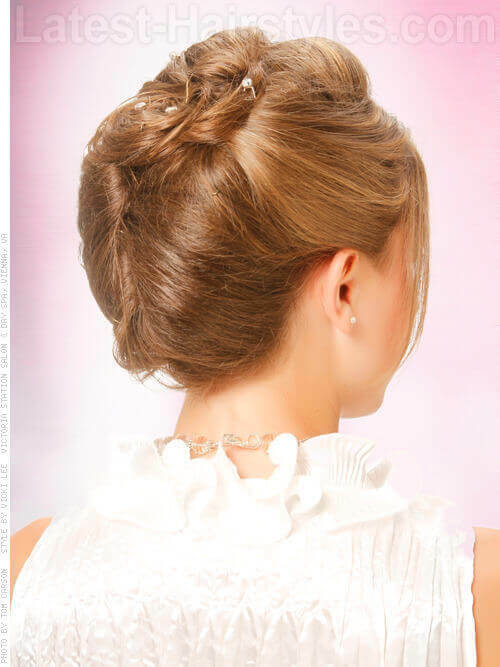 Hair that is at least to your shoulders and has a smooth texture will help in creating your bun hairstyle. Always do a few trial runs to make sure your hair will be long enough to create this bun. Try different parts and bun sizes. Beautiful height creates an elegance and ageless look for your bridal hair! Before blow drying your hair, use a medium hold volumizing mousse. Blow dry hair using a medium to small-sized round brush. Depending on what you are doing in the back (bun, braid, curls, etc.) plug in your curling iron and separate hair into three sections. If you are going with curls or a textured bun, curl hair in 1½-inch sections, alternating directions. Let the hair cool completely before manipulating. To achieve the dramatic height on top, create a section from the corners of your eyebrows around the back top of your head. Next, divide that section, taking the underneath and separating it from the front top section. Take the underneath section and give it a soft backcombing. Starting at the ends, create a roll. Roll this hair down to your scalp. The size of the roll will depend on how high you want to go! Smooth the top section over the roll and secure in back with bobby pins. Incorporate the ends into a loose curled bun, braid, or cluster of curls. Mist with your favorite hairspray and add all of your beautiful adornments! For a great big blowout and height that lasts all day, my favorite mousse is Pravana’s NEVO Full Volume. It gives hold without any stickiness and is easy to brush through when blow drying! Round, square and heart shaped faces look fabulous with some extra height, while hair that is medium in length and texture will help create this style best. It is a must to have an extra mirror handy when creating this style. You want create volume, but you have to be careful of being lopsided or full then flat. Checking the back and sides in the mirror is sometimes better than a BFF there to help! Soft curls delicately pulled back and a feminine fringe swept off to the side — this look has become the new classic! Before drying hair, apply a medium hold gel or mousse. Comb through to ensure it has covered every strand. Blow dry using a medium to small round brush, depending on the length of hair. Once hair is completely dry, divide it into three sections — each side and back — then secure with clips. Begin curling, alternating going towards your face and away from your face. Let all curls cool completely before applying a texture paste to hands and running fingers through hair, separating curls. Softly arrange hair swooping back and secure with bobby pins. If your hair is long, you’ll want to twist at the root and pin to lift the length up. Cross pins in an X formation to make them more secure. A great hairspray is always necessary with formal styles! One of my favorites in the salon is Pravana Super Shape. Spray a little while working in your style, and give another spray when done to hold it in all night! 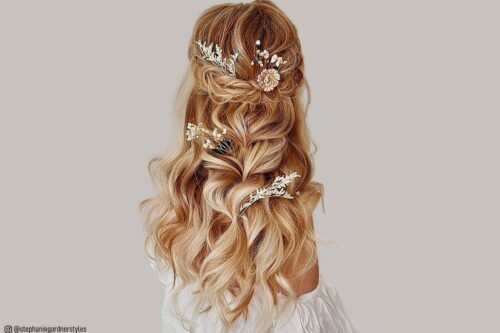 Any face shape can wear this softly curled bridal style, while hair that is naturally wavy or curly helps to hold curls in all night. Also, a medium texture and density will make this look easy to achieve. You can use all sorts of different curling irons to achieve different types of curls. Play around before the big day to find your perfect curl! Soft and delicate curls cascade over a crossed back in this beautiful bridal hairstyle. This look is easy to achieve even though it looks like you spend a ton of time on it! Begin by spraying dry hair with a beach wave or texture spray. Blow dry it in if you get a little overzealous! Curl hair using a larger barrel curling iron or curling wand (1½-inch to 2-inch). Let curls cool before continuing. Now you’ll need to create three sections — one in the nape of the neck that will be used to create the crossover, another in the top to create the volume, and the rest in the middle. Take the middle section and put in into a ponytail, secure with an elastic band that is clear or matches your hair color. Next, create the volume in the top by back combing the top section and bringing it back to the ponytail. Secure with bobby pins. Begin arranging curls, using bobby pins that match your color to secure. Add in the end from the top section. Take the bottom section and divide in two. Cross over and smooth each section, one at a time. Secure with bobby pins and incorporate the ends into your curls. Spray with your favorite hairspray and add your veil. You are ready for your big day! Your curling iron is so important when creating curly styles. I always buy Gold and Hot irons. They last forever and have adjustable heat settings. You can find them at your local beauty supply store or on Amazon.com. Oval and diamond face shapes look exceptionally well in this style, while hair that is medium to thick and holds a curl well does great in this look. However many bobby pins you think you’ll need, buy double that! You don’t want to run out on your wedding day. We love this new take on the classic French twist. Soft, flowing curls and an airy twist in the back is perfect for a flowing bridal gown! Before blow drying, apply a medium hold gel or mousse to hair. Dry hair using a medium round brush, giving your crown a lot of volume. Curl hair using a 1½-inch curling iron, wand, or flat iron. Mist with hairspray and let cool completely before starting your twist. Gather hair off to one side in the back. Begin twisting hair softly while working your way up towards the top of your head. Secure with bobby pins all along the twist, starting at the base. Leaving your curled ends loose, end the twist on the opposite side of your head. Make sure to really secure the ending of twist by crossing bobby pins over in an X pattern. Arrange curls to hide any pins and accentuate your face. Spray one last time with a great hairspray and add any adornments to your new-age French twist! A great gel-type product to give your hair the right texture and hold is Kevin Murphy Beach Resort. It’s easy to blow dry into hair and preps hair perfectly for a formal bridal style! Heart and diamond face shapes look great in this look, and hair that is thick in texture and longer gives you enough hair to achieve it. If your strands are fine and you want to add length and bulk to your hair, consider investing in some clip-in extensions. Your stylist can teach you how to properly put them in and aid in matching the color up perfectly! Always a bridal favorite, the all up with curls look is easy to achieve and always looks fabulous! Before any curling can start, you need to apply a medium hold gel or mousse to damp hair. Blow dry hair with a medium to small round brush, depending on the length. Once hair is dry, section into three (each side and back) and secure with clips. This helps to make the curling process easier and more efficient. Begin curling hair with a 1 to 1½-inch barrel iron, curling some towards your face and some away from your face. Let all curls cool before you begin lifting up. Section hair into two sections. The first section will be on top towards the crown and the second section right underneath. Put each section into a ponytail, securing each with a clear elastic. Make sure the ponytails are very close to each other. Begin placing curls and securing using bobby pins. Be sure to hide the ponytail bases so you’re not to give away your secret! You can leave some curls loose too. Once all the curls are perfect, add your adornments and veil and get ready to walk down that aisle. A great mousse that keeps hair shiny and soft with just the right hold is Pravana’s NEVO Full Volume. It’s not only great for prepping tresses for bride hairstyles, but it’s great for everyday blowouts too! Any face shape can wear this updo. You can leave more hair down around your face if it makes you feel more comfortable. Hair that is medium to thick and has some natural wave or curl to it will help to achieve this style. Making sure your hair color or highlights are fresh for your bridal hair is important. I recommend brides to come in about a week and half before the big day. This gives enough time in case anything isn’t perfect, and the color won’t look too new. Braids are still all the rage in bride hairstyles! This interesting braid will look great for a formal or casual wedding. Prep dry hair with a texture spray. This gives hair grip and makes braiding easier. Starting in the front, create a three-strand braid. As you continue braiding, you will only add hair to the top section. This creates hair to be added to the braid once it wraps back and across the back of your head. Continue the braid to behind the opposite ear, braiding across the head rather than down towards the neck. Once you reach the area behind the ear, begin braiding back towards the other ear and slightly angling down. Finish the braid down through the length of the hair, or leave ends loose to be curled or worn straight. I love to use Pravana’s NEVO Invisible Control texture spray when I am doing any type of braiding at the salon. It smells fabulous and works amazing, creating the perfect amount of hold and control. Any face shape can wear a wrapping braid. You can customize how much hair you want loose around your face or braid it in with your fringe. Hair that is a bit denser is great for braiding, and you’ll need some length to achieve this look. Practice makes perfect! Having a few good trial runs of this style before the big day will make styling it a breeze and help to relieve any wedding day hair stress! This easygoing style works for any bob-wearing bridal babe! It still looks very dressed up, but without any stuffiness. Apply a styling cream to damp hair, and a root volumizer at the crown. Blow dry hair using a medium round brush. Once hair is dry, touch up any ends that may need extra smoothing with a flat iron set to the lowest heat setting for your hair type. Beginning in the middle, take imperfect sections to pin back. Give them a slight twist as you bring them back, and just before pinning, slightly push them forward. Secure these sections with bobby pins in an X pattern. Continue through the top of head and down the sides, leaving one to two inches out above the ear. Mist with your favorite hairspray and add your veil! Pravana’s NEVO Lived In Hair Potion is amazing on both damp or dry hair for creating volume and texture! It comes out as a powder, but instantly transforms in to a dry gel. One use and you’ll be hooked! Round, square and heart shaped faces wear this style (and a bob) beautifully! Hair that is naturally straight and fine to medium in texture creates a perfect base for this style. Play around with different placements for your veil! You may be surprised how moving it up or down on your head creates different looks. This simple, curled up topstyle is sleek and easy! It’s great for that no fuss bride that wants it all up to showcase her jewelry and beautiful face. Before blow drying, apply a medium hold gel or mousse to hair. Comb through to ensure it is evenly distributed. Once hair is completely dry, section into three sections (each side and back) and secure with clips. Curl midlengths and ends of hair using a curling iron, wand, or flat iron. Gather all hair to center top of head and secure with a clear elastic. Begin arranging curls and securing with bobby pins. Take a few small sections and braid to incorporate into curls. Finish with your favorite hairspray and shine spray! A fabulous hairspray that has hold and shine is Bed Head’s Masterpiece. A little goes a long way, so start off slow! Confident beauties with heart, oval or diamond shaped faces look great in this look, while hair that is wavy in texture and medium to thick gives a great base for these curls. If you have a lot of hair, break the ponytail up into two or three ponytails to make sure you won’t have any elastics breaking! Create a stir at your wedding wearing a double twist in your hair with beautiful adornments! Beginning with damp hair, apply a texturizing cream. Blow hair dry BIG with a medium to small round brush. It’s important to start with big, full hair. It will make styling easier. Curl ends with large curling iron. A 1¾ or 2-inch iron works well for longer hair. Part hair in desired spot in the front, then angle a center part down the back of head towards the neck. Choose one side to start with, and begin adding backcombing starting at the part line. Beginning at the base of neck, begin twisting hair, working your way up to the top of head, securing with bobby pins as you work up. Using the side of a smoothing brush or comb, smooth the sides and mist with hairspray. Repeat backcombing, twisting, and securing on opposite side. Make sure when securing twist that you hide the bobby pins! Make sure everything is smoothed out and finish with hairspray. A great tool when backcombing a style like this is dry shampoo! My favorite is Pravana’s Fresh. It gives volume, texture, and holds in backcombing like no hairspray can! Heart, diamond, and oval faces look fabulous in this double twist. Hair that has natural texture and is medium to long will be easiest to twist into this shape. Make sure to stand straight and check over your twists — you don’t want to end up lopsided! Check hair with a hand mirror on both sides and back before walking down the aisle. That’s right, we said beehive! But this softer, more modern version won’t have you looking like Marge Simpson. While hair is damp, apply a volumizing mousse from root to ends. Blow dry hair using a small round brush for maximum volume. Once hair is completely dry, set in hot rollers. Roll the top going back and the sides and back going up. This will aid in keeping your curls up high! Let rollers cool completely before removing. Using your fingers, break up curls. Next, use a smoothing brush to softly backcomb curls. This gives them the soft airy feel. Next, gather curls towards the top of the head and secure with an elastic band. Place curls and secure with bobby pins. Back comb curls as needed to achieve desired look. A great volume encouraging mousse is Kevin Murphy’s Body Builder. You can add more than one layer of product for more hold without weighing hair down. Heart, oval and diamond face shapes look great in this high look, while hair that is fine to medium texture will easily achieve the airy volume. This is definitely a look that you’ll want to practice a few times before the big day. Getting the curls just right and figuring out how high you want to go takes a few tries. The best day to do a trial run on your wedding day hair is when you have a dress fitting so you can see them together! This simple, carefree side bun is easy to achieve, but no one needs to know that! On dry hair, apply a texturizing spray. You can blow dry it in if needed. Create a part, straight or imperfect. Bring hair to desired side and secure with an elastic band. Braid hair in a three-strand braid through the ends. Holding the ends, gently loosen the braid by pulling small pieces and spreading them out. Wrap braid into bun shape and tuck in ends. Secure in various spots with bobby pins. It’s just that easy to have a beautiful, perfectly imperfect braided bun! My favorite texturizing spray is Pravana’s NEVO Invisible Control. It gives me just the right amount of grip and hold when creating braided looks at the salon. Bonus — it smells amazing, too! Any face shape can wear this easy braided bun, and hair that is long and thick creates the best braid to secure in a bun. If you need a little extra thickness in your braid, you can always pick up some clip-in extensions. Your “crowning glory” (aka your hair) can definitely help set the mood for your special day. 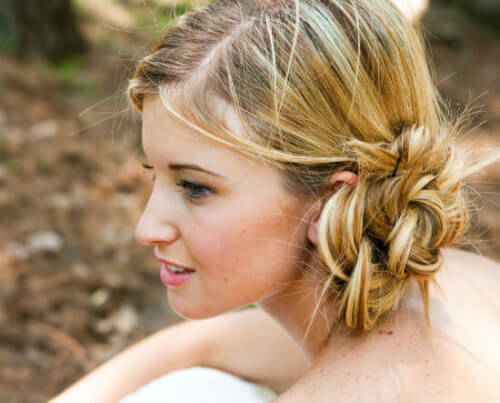 Up, down, braided, or bunned, your hair will be perfect for your walk down the aisle!